The idea is simultaneously incredible and absurd: Who thought it'd be a huge money-maker to manufacture and market a drink from a movie that virtually no one saw? But even though Idiocracy, Mike Judge's funny-but-flawed comedy from 2006, died a quick, painful death at the box office, it has inspired a small cult. (Our own Nathan Rabin declared it one of last year's best films.) 500 years in the future, the population has gotten so stupid that society is on the verge of collapse, taken over by corporations and idiots. 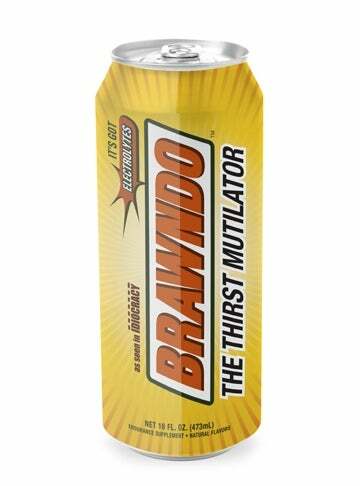 One of the funniest bits is that no one drinks water–they all consume a ridiculous energy drink called Brawndo. (Slogan: "The thirst mutilator," clearly indebted to an old soda called Rondo, whose slogan was "the thirst crusher.") The world's crops are dying because they're being fed with Brawndo. The logic: "Brawndo's got electrolytes. And that's what plants crave. They crave electrolytes. Which is what Brawndo has. And that's why plants crave Brawno. Not water, like from the toilet." It's a funny joke, but can it sustain a new energy drink in a crowded market? Depends on the taste, I guess. Taste: Before we get to that, it should be noted that the color is incredibly intense. Like glow-in-the-dark Mountain Dew intense. That's a bit off-putting at first, but the taste isn't half-bad, and this is coming from someone who doesn't much care for energy drinks. It's extremely sweet, with lime as the strongest flavor. It also has all the taurine and caffeine that Red Bull addicts are looking for. I can't see slamming one of these, or even drinking more than one a year, but it beats the flavor of most energy drinks. And you're doing your part to help the world of forgotten film with every can. Office reactions: "I can't tell if it's overly carbonated or overly syrupy. Or both," "Quite an aftertaste for sugar water," "Like liquid lime Jello. Also, the insta-sugar rush is giving me the shakes," "An intense, sickly lime syrup taste driven home by carbonation. The plants shall crave it more than I," "A bit like Ecto-cooler. Not half bad!"